A quick guide to everything B.hooked has to offer…Right at your fingertips! There are many things B.hooked Crochet has to offer from product and yarn reviews, to free patterns, video tutorials, techniques…I thought it would be helpful to create a resource page that you can always come to for your crochet needs. On this page, you will find convenient links to everything I believe will help you advance your crocheting skills. I recommend bookmarking it for your reference and convenience. Enjoy! Disclosure: Please note that some of the links below are affiliate links, and at no additional cost to you, I will earn a commission if you decide to make a purchase. Please understand that I have experience with these products and services, and I recommend them because they have been helpful and useful to me, not because of the small commissions I make if you decide to purchase from the links. Please do not spend any money on these products unless you feel you need them or that they will help you achieve your crocheting goals. The Beginner Crochet Series is the best way to learn how to crochet. Brittany has adapted her teaching style to accommodate how her audience, adults, learn best. Each video has a specific topic with a similar framework to optimize your learning experience. Because the Beginner Crochet Series is offered for free through YouTube, you will be in control of the pace at which you learn and Brittany will be there guiding you every step of the way. With the Beginner Crochet Series by B.hooked Crochet you will not only learn how to crochet, but you will be completing your very first crocheted projects! B.hooked Crochet has dozens of free crochet patterns available for you to enjoy, many of which include a step-by-step video tutorial. No matter what level of crochet you fit into (beginner, intermediate, advanced or anything in between), you’re sure to find something exciting to make. 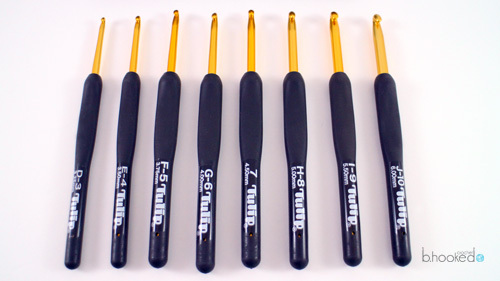 Tulip Etimo Crochet Hooks: I started using Tulip Etimo crochet hooks in in early 2015. For me, they are comfortable and very easy to work with. I have used nearly every crochet hook on the market (and I own more hooks than I care to admit) but these are the hooks I come back to time and time again. I’m very particular about the products I recommend to my readers, but these ones made the cut! I have prepared a product review for these hooks so that you may decide if they are right for you. You can access the product review and video here. I’m here for you as both an instructor and as a friend. I want to hear your stories. I want to know how else I can help you. I want the B.hooked Crochet experience to be our experience, together. That’s how we all learn and grow together, including me. I do my best to respond to emails. I treat everyone equally. And I firmly believe that I’m not special, just a normal gal who enjoys crocheting. In everything I do here, I truly want to help you achieve your goals.